My buddy Steve came over to help me hang pictures at my new place this weekend. After we were done, we decided to grab some grub and ended up at Dish in La Canada. Turns out this place is all bark and no bite. The have a great sign, a tasty sounding menu, and a interesting room. This is all to no avail, as they failed on almost all counts. In an effort to be concise, I will just give you a bulleted list. Getting Seated - us and another group of people waited about 5min. before anyone even spoke to us. After that it was another 5min. to get seated. Beef & Barley Soup - this was basically salt porridge. Campbell's is better. Drinks - Steve ordered the drink special, a Mint Julep. With the promise of fresh mint, I opted for a mojito. Both drinks were basically well alcohol over ice with a sprig of lime on top. Quite awful. We hardly touched them. 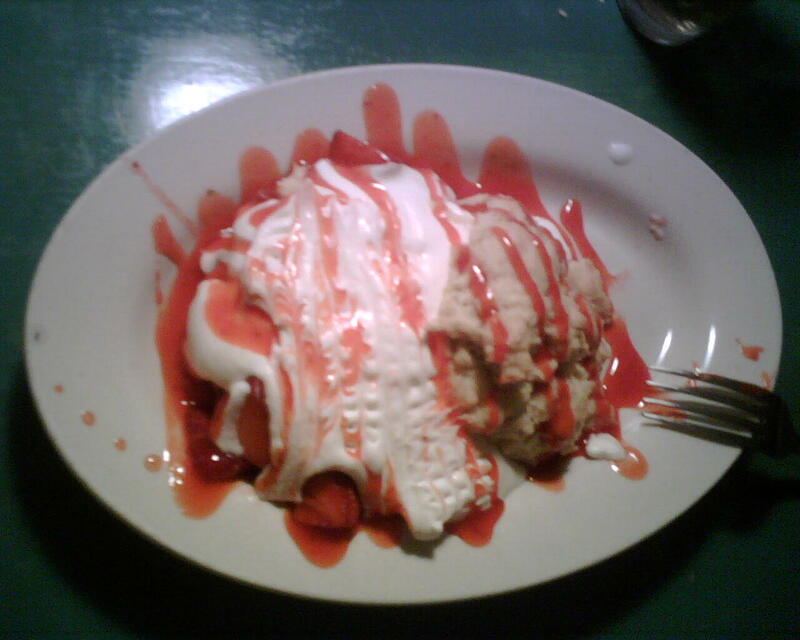 Strawberry Shortcake - this was pretty icky too. Decent strawberries, but the shortcake tasted like a store bought scone heated up in a microwave. Bathroom - Their men's room was a completely disgusting in ways that I don't care to mention. Use your imagination. In short - I will not make a another visit to Dish, even under duress. And they have a $7 quesadilla "appetizer", now that's an outrage! That sign is pretentious, and it says nothing about the establishment. I would avoid this place based on the sign alone. Food is definitely pricier in La Crescenta/La Canada than it was when I lived in Highland Park. But so far the slow pace small town charm is winning me over. Going to Burbank or Glendale seems like the big city. I am going to need to make frequent forays back to HP/LH/EP so I don't get too parochial.